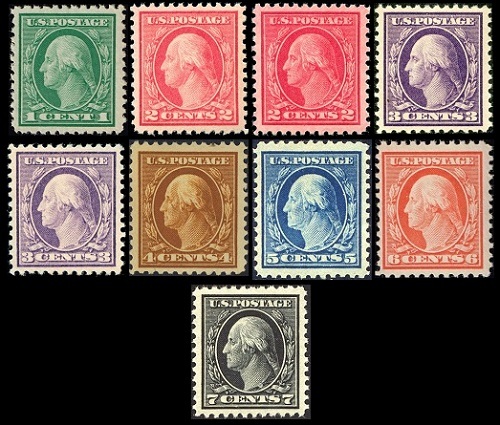 Definitive US stamps of the Third Bureau Series went through more changes in the period from 1917 through 1922, when the series, thankfully, ended. Group 1 - Stamps printed on double-lined USPS watermarked paper that are all perforated 12. Group 2 - Stamps printed on single-lined USPS watermarked paper that are either perforated 12 or perforated 8-1/2 (on some coils). 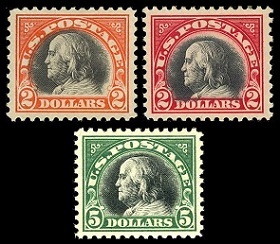 Group 3 - Stamps printed on either single-lined USPS watermarked or on unwatermarked paper that are perforated 10, with the exception of some coils that are perforated 8-1/2. Group 4 - Stamps printed on unwatermarked paper that are perforated 11 (with some exceptions). This webpage will focus on the US stamps in Group 4 above. Describing these US stamps individually, as done in previous pages in this section, would be repetitious and unnecessary. For this page, and the other pages about the Third Bureau Series, the different stamp issues and varieties will either be described with text or by the aid of tables containing their technical attributes. The separation gauge of the perforated US stamps was changed to Perforated 11 during 1914. With the introduction of the perforated 11 US stamps, all the definitive US stamp issues had to be re-issued. They are all shown directly below. Denominations: 1 Cent (Green), 2 Cent - Type 1 (Rose, Carmine Rose, Lake), 2 Cent - Type 1a (Deep Rose), 3 Cent - Type - 1 (Deep Violet), 3 Cent - Type 2 (Violet), 4 Cent (Brown, Orange Brown), 5 Cent (Blue), 6 Cent (Red Orange), 7 Cent (Black), 8 Cent (Olive Bister), 9 Cent (Salmon Red), 10 Cent (Orange Yellow), 11 Cent (Light Green), 12 Cent (Claret Brown, Brown Carmine), 13 Cent (Apple Green), 15 Cent (Gray), 20 Cent (Ultramarine), 30 Cent (Orange Red), 50 Cent (Red Violet), 1 Dollar (Violet Brown). Designs: George Washington (1 Cent - 7 Cent), Benjamin Franklin (8 Cent - 1 Dollar). These stamps were made from an old stock of the 1908 imperforate 2 Cent stamps, which were returned to the Bureau in 1917. Paper Type: White, Double-line USPS watermark. In August of 1918, the $2.00 and $5.00 US stamps from the Second Bureau Issue, were finally replaced by new definitive US Stamps. The new stamps were in a horizontal format, with new frames that closely resemble those of the high denominations of the upcoming Fourth Bureau Series. The vignettes for all of them were, of course, a left facing profile of Benjamin Franklin, printed in black. The $2.00 denomination with the carmine frame was issued at the beginning of November 1920. Denominations: 2 Dollar (Orange Red & Black, Carmine & Black), 5 Dollar (Deep Green & Black). Scott Catalog Numbers: 523, 547, 524. In late 1918, the Bureau of Engraving and Printing began producing large volumes of 1 Cent, 2 Cent, and 3 Cent denomination US stamps, utilizing the offset printing process. These stamps were not "engraved" or "printed with the ink raised above the paper surface", as were previous issues. The surface of these offset printed stamps is smooth and the ink is flat against the surface of the paper. This new process produced some of the ugliest US stamps ever printed, but fortunately for collectors, the offset process was abandoned in 1920. A text description of the offset printing Types of the 2 Cent and 3 Cent denomination US stamps of the Third Bureau Series follows. For drawings of these types, refer to the Scott US Specialized Catalog, or any of the other Scott Catalogs with US listings. 2 Cent - Type IV : The top line of the toga button is broken. The shading lines in the toga button are arranged so that the curving of the first and last lines forms the letter "D" facing a reversed letter "D". The line of color in the left "2" is very thin and usually broken. 2 Cent - Type V : The top line of the toga is complete. There are five vertical shading lines in the toga button. The line of color in the left "2" is very thin and usually broken. 2 Cent - Type Va : The characteristics are the same as Type V except in the shading dots of the nose. The third row of dots from the bottom has four dots instead of six dots. The overall height is 1/2 mm shorter than Type V.
2 Cent - Type VI : General characteristics are the same as Type V, except that the line of color in the left "2" is very heavy. 2 Cent - Type VII : The line of color in the left "2" is invariably continuous, clearly defined and heavier than in Type V, but not as heavy as Type VI. An additional vertical row of dots has been added to the upper lip. Numerous other dots have been added to the hair on top of the head. 3 Cent - Type III : The top line of the toga rope is strong, but the fifth shading line is missing. Central shading line of the toga button consists of two dashes with a central dot. 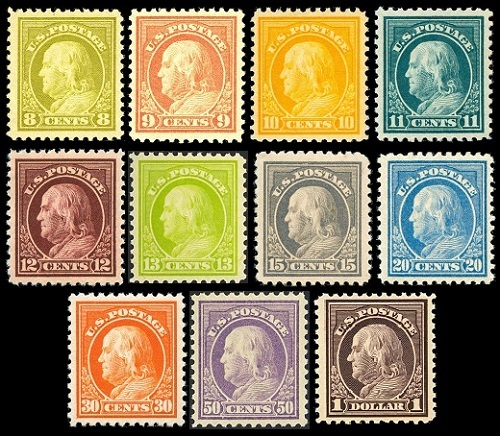 The "P" and "O" of "POSTAGE" are separated by a line of color. The frame line at the bottom of the vignette is complete. 3 Cent - Type IV : The shading lines of the toga rope are complete. The second and fourth shading lines in the toga button are broken in the middle, and the third line is continuous, with a dot in the center. The "P" and "O" of "POSTAGE" are joined. The frame line at the bottom of the vignette is broken. Denominations: 1 Cent (Gray Green, Dark Green), 2 Cent - Type 4 (Carmine), 2 Cent - Type 5 (Carmine), 2 Cent - Type 5a (Carmine), 2 Cent - Type 6 (Carmine), 2 Cent - Type 7 (Carmine), 3 Cent - Type 3 (Violet), 3 Cent - Type 4 (Purple). Denominations: 1 Cent (Green), 2 Cent - Type 4 (Carmine), 2 Cent - Type 5 (Carmine), 2 Cent - Type 5a (Carmine), 2 Cent - Type 6 (Carmine), 2 Cent - Type 7 (Carmine), 3 Cent - Type 4 (Violet). Denominations: 1 Cent (Gray Green). Format Type: Panes of 70 and 100 stamps. Designs: 19.5 - 20 x 22 - 22-1/4 mm. Denominations: 1 Cent (Green), 2 Cent - Type 2 (Carmine Rose), 2 Cent - Type 3 (Carmine Rose), 3 Cent - Type 2 (Violet). Format Type: Panes of 100 stamps. Designs: 19 x 22-1/2 - 22-3/4 mm. Format Type: Panes of 100 stamps. Designs: 19 x 22-1/2 mm. Format Type: Panes of 70, 100, and 170 stamps. Designs: 19-1/2 x 20 - 22 mm. Denominations: 1 Cent (Green), 2 Cent - Type 3 (Carmine Rose). Before we bid farewell to the Third Bureau Series, there are a couple things I would like to mention which I have intentionally omitted from this four web page review of the series. 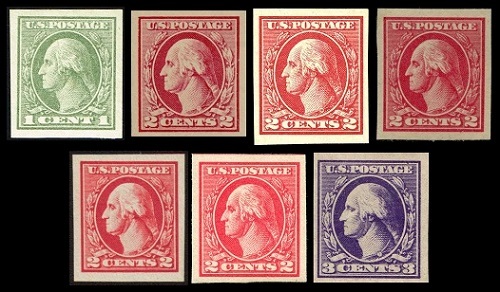 During the Third Bureau Series, generally occurring on the latter unwatermarked Flat Plate Press issues, there were many instances of compound perforations occurring on most of the denominations of the series. For example, perforation 11 x 10, perforation 10 x 11 etc. Most of these occurred during 1916-1917. These were perforation production errors and not regular issues. 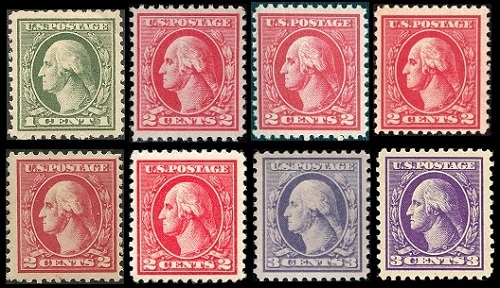 Most of the stamps with these compound perforations are very rare, priced in the thousands of dollars, and they rarely appear on the philatelic marketplace. For most collectors of US stamps, these are seldom encountered and prohibitively expensive. "During the production of the 1916-17 series, it was observed that on one 2 Cent plate, No. 7942, three of the 400 images had become noticeably worn. Two of these images were a vertical pair, appearing near the bottom of the top left pane of 100. The remaining image appeared near the top of the bottom right pane. When replacing these three images, the technician responsible inadvertently transferred 5 Cent denomination images onto the three problem positions of the 2 Cent denomination plate. This error was not noticed for several weeks, and eventually, three different carmine-colored 5 Cent stamps were distributed by the Post Office". These three production errors are not required for the three affected Third Bureau Series sets. In fact, most albums do not include them on the pages for the regular stamps for each of the three sets of stamps. If the collector wishes to acquire these as specialized collateral material, the perforated 10 and perforated 11 examples are readily available for a few hundred dollars each. The imperforate stamps of the 5 Cent Carmine error are rare and seldom encountered. Scott #505 - 5 Cent Rose - unwatermarked - perforation 11. Scott #467 is shown in the image above.